The Disappearing Nine Patch quilt block is named for a specific reason. You start with the simplest of nine patch blocks. Then, by cross-cutting the block into four sections and rotating some of those sections, you come up with a very different looking block. This block is designed with machine piecers in mind as you cannot cross-cut pieces when you are stitching the block by hand. However, I have also designed the pattern for hand piecers and I named it Mosaic. 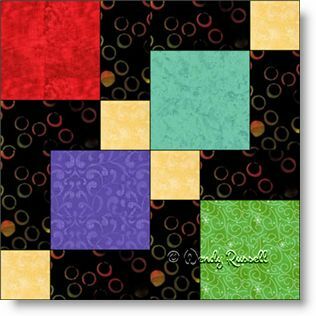 For this version of the block -- the machine pieced one -- the background is dark and the accent pieces are light. This is the reverse of the fabrics in the hand pieced version -- (just so you can see something different). The two sample quilts illustrated use common settings of the blocks -- an on point version and a side by side version.